Ocracoke is a town that loves to dress up and put on a show. 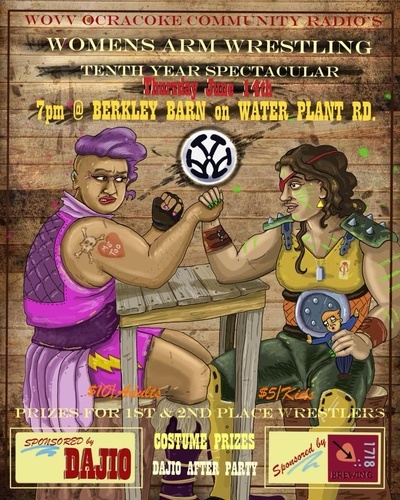 The Annual WOVV Women’s Arm Wrestling Tournament contestants never disappoint with their costumes and wrestler personas. This double-elimination tournament is as much about the spectacle as the strength, but the ladies will impress you with their powerful biceps and fierce determination. The winner gets a year’s worth of bragging rights! WOVV 90.1FM is Ocracoke’s own community-supported radio station. Mid-June.